Wood Innovation and Design Centre at the University of Northern British Columbia. Courtesy MGA/Ema Peter. The oldest multistory wood-structure building in the world is almost 1,000 years old, surviving dynasties, weather, and even earthquakes. The Wooden Pagoda of Yingxian in China is nine stories and 220 feet tall. Its rustic, octagonal mass is made from 54 different types of wood joints and not a single nail. Given this example, the common-sense reasoning why we don’t build tall wood buildings anymore seems less sensible. Wood is a building material that fabricates itself with a bit of sunlight, dirt, and water. It’s lighter than steel but can be just as strong. And it actively absorbs and sequesters carbon from the atmosphere. The seductive, plastic possibilities of concrete come with an environmental cost architects are coming to grips with. It’s not likely the timber-framed pagoda would survive a building inspection today, but new wood structural systems are being researched and repackaged to reach new heights. It’s called “mass timber,” and it could drive a materials revolution every bit as transformative as the advent of the I-beam and curtain wall. Mass timber refers to composite wood systems combining multiple pieces of wood to increase their compressive and tensioned strength. 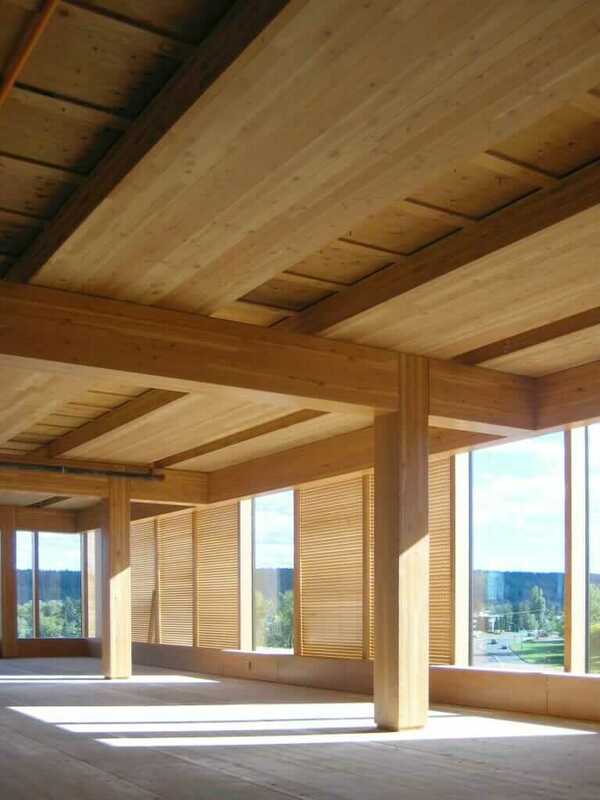 These systems are increasingly used in all-wood structures up to 14 stories. One design competition champions 10- and 12-story wood buildings. (Building codes often limit traditional light timber-framed construction to six stories.) A single mass-timber element can be 150 feet long or 20 inches thick. Wood Innovation and Design Centre. Courtesy MGA/Ema Peter. Some of these systems were invented in North America, but cross-laminated timber (most often used in high-rise construction) was developed in Europe decades ago. Much mass-timber research involves architects and engineers finding ways to apply existing systems to new building applications. “It really is a matter of understanding what the applications [are], what the benefits are, and doing the research that allows the codes to come up to speed,” says Jennifer Cover, executive director of WoodWorks, an organization that provides technical support to architects and engineers designing wood buildings. But Michael Green, who has become something of a John the Baptist for tall wood buildings, says mass timber is an opportunity for architects to get directly involved in material science and development. “We as a design community can now get back into the fabrication side of the conversation,” he says. Green says he coined term “mass timber” six years ago. 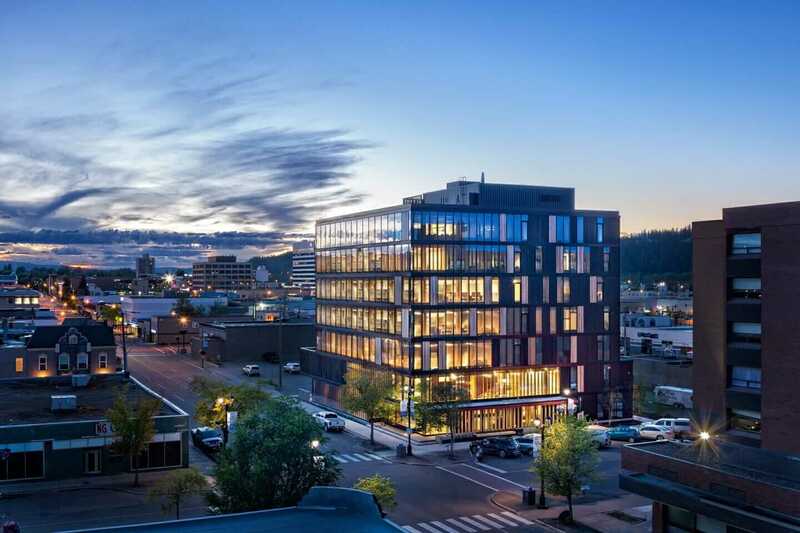 His 96-foot-tall Wood Innovation Design Center (WIDC) at the University of Northern British Columbia is the tallest wood-structure building in North America, and a handful of newer projects are hot on its heels, some of them Green’s. He’s working on proposals for 30-story wood buildings. There are heavy timber systems that bond together thick pieces of dimensional lumber. NLT (nail-laminated timber) uses aluminum nails to connect each piece, which can be cut through to alter dimensions. GLT (glue-laminated timber) uses adhesive to bond together lumber. CLT (cross-laminated timber) adds additional strength by laying each piece of dimensional lumber at a perpendicular angle, like a Jenga tower. These types are often used as panel systems, though CLT can be used in nearly any structural function. Similar to plywood, laminate systems glue together thinner pieces of lumber and are often used as beams. LVL (laminated veneer lumber) sandwiches thin, wide parallel sheets of wood together. LSL (laminated strand lumber) presses together smaller chips of timber that also run parallel. Composite systems, made from both concrete and mass timber, compromise by applying wood’s green credentials while also supporting taller buildings. 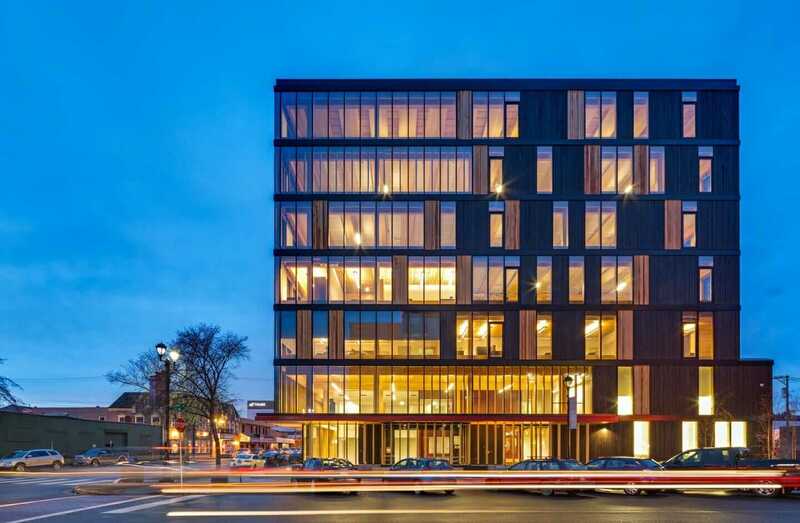 For example, a SOM report on wood construction found that hybrid systems still save 60 to 75 percent of carbon emissions compared to a concrete-only equivalent building. As mass-timber systems advance, “engineers will determine where in the building the various materials work best to achieve both the desired structural and environmental performances,” Cover says. What Are the Advantages of Mass Timber? In addition to its ratio of weight to strength, the biggest advantage is carbon sequestration. While trees are growing, they pull in carbon from the atmosphere and store it in the wood: The wood used in a 20-story building could sequester 3,150 tons of carbon. The amount of concrete used to build such a structure would emit 1,215 tons of carbon. These emissions savings are the equivalent of taking 900 cars off the road for a year. Additionally, wood is flexible and speedy on a job site; it can be easily cut and altered as needed. And wood can be recycled for many uses once taken out of a building. Wood is often used as a finishing material in large buildings, and its rich natural texture (and people’s attraction to it) demonstrates that it can work as structure, external skin, and internal surface. Wood Innovation and Design Centre. Courtesy MGA/Ed White. Researchers haven’t uncovered any basic structural or architectural functions wood can’t handle, but it’s not perfect. Sound dampening is often an issue with wood structures, says Oregon State Wood Science and Engineering Professor Lech Muszynski. “It’s no accident that your violin is made out of wood,” he says. Wood is also vulnerable to insects; steel and concrete are not. And hot, moist climates require careful detailing to avoid moisture and decay. As for fire, all building materials have to meet the same building codes, but because mass timber is thick and solid, it chars on the outside at a slow and predictable rate while retaining strength, slowing combustion and allowing time to evacuate. The char protects the wood from further degradation, maintaining the building’s structural integrity and reducing its fuel contribution to the blaze. That means structures can be built taller using mass timber. Mass-timber boosters counter that the United States’ 751 million acres of forest have been stable for many decades. That’s a massive area—one-third of the country’s landmass. “For every 8- to 10-story building we do in CLT, North American forests grow [enough] wood for that every five minutes,” Green says. A way to encourage stability is to ensure forest acres maintain a high monetary value—for example using the output to make many more highly sustainable buildings. “Strong markets for wood products give landowners an incentive not only to invest in forest management, but to keep lands forested instead of looking to profit by converting it to other uses,” Cover says. Researchers are investigating other sources like bamboo, the fastest-growing plant on the planet, for mass timber. At OSU’s Wood Science and Engineering lab, scientists are finding ways to use low-value wood in mass-timber systems.